2016 Harley-Davidson Dyna Low Rider. Picture credits - Harley-Davidson. Submit more pictures. It�s powerful just leaning on its side stand. 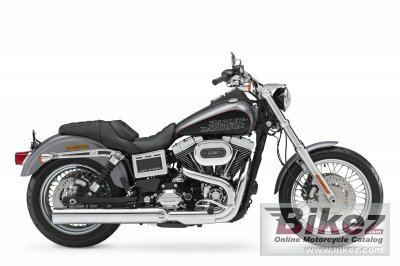 One look at the muscular Twin Cam� 103 engine that feeds into the liquid curves of the big two-into-one exhaust is all it takes to see that the Low Rider� model is built to be ridden long, hard and often. That�s as it should be. For decades the Low Rider� name has been synonymous with riders who can�t get enough. Now it�s built for more miles than ever. With mid-mount controls. Price as new (MSRP): US$ 14339. Euro 16335. Prices depend on country, taxes, accessories, etc. Front brakes: Single disc. 4-piston fixed. Ask questions Join the 16 Harley-Davidson Dyna Low Rider discussion group or the general Harley-Davidson discussion group. Bikez has reestablished Bikez.info motorcycle web shop overview. Here we present the major online shopping possibilities for motorcycle parts, gear and accessories. This includes customizing and insurance. Search and compare products and prices. Try our 2016 Harley-Davidson Dyna Low Rider discussion forum if you have questions or comments. Information about any technical issue is always welcome.